I, like others it seems, am keen for BL2e expansions. I was a keen BL1e player and, while waiting, I thought it might be fun to use the armies from BL1e in 2e. I realised that the armies had a place. I have worked on Hobgoblins, Dwarfs and Humans from BL1e. I present the Hobgoblins presently and the rest will follow as I format and upload the stats. Tribes of hobgoblins wander the desert regions of Al-Kalim. They are a loose collection of tribal nations that pose little threat to the more civilised regions. However, sometimes a tribal leader manages to organise the hobgoblins into a fearsome raiding force to plunder the civilised lands. When the Hobgoblins go to war, the poorer members of the tribes fight as infantry. Equipped with curved swords and shields they are hastily banded into mobs. With little to no training these troops cannot be relied on to stand and fight though they are light on their feet and can harass the enemy with advantageous ground. These Hobgoblins are mostly armed with simple missile weapons, such as sling or bow. As with the infantry, not much is expected of these troops but they have a place in disrupting the enemy. The true warriors of Hobgoblin society are the Marauder cavalry. Made up of the elite of the tribe, they ride into battle on the backs of large hyenas and sand lizards. Highly manoeuvrable and fierce, the marauders relentlessly hunt down their prey. Riding atop swift ostriches, these elite cavalry are deadly with the reflex bow. They shoot with speed and accuracy and can even turn in the saddle to shoot as they swiftly speed away. 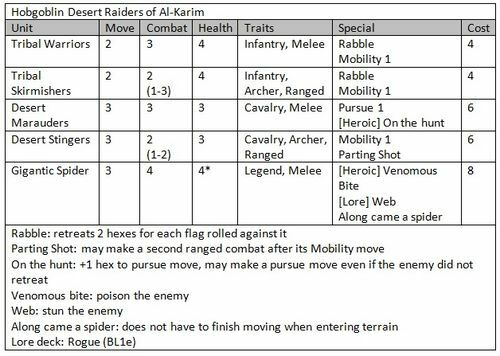 The best tribes have managed to capture and train the desert spider; a truly gigantic beast that makes its home in the desert dunes. These beasts are goaded into battle where their deadly venom and ability to web their prey is used to great effect. Hobgoblins specialise in hit and run attacks and guerilla tactics. Use the Rogue Lore deck from BL1e with the following changes. Very well done. If this had been done with BL 1st Ed, it would probably still be in print and have twice as many factions. Similar case can be made for Battles of Westeros. The Dwarfs are a mostly insular people dwelling in underground cities in the region of the Dunwarr mountain range. Though they have mostly abandoned the chaos of the outside world, they can be roused into a fearsome citizen militia when needed. The bulk of the dwarfish armies are the clansmen; a citizen militia that forms the main battle line. Armed with sword and buckler, these troops can be relied upon to stand their ground no matter the odds. The dwarf nobility is better armed and better trained than the clansmen. Wearing quilted armour and carrying a great sword, these dwarfs fiercely charge into the enemy. If they are able to maintain their formation they can penetrate right into the heart of an enemy regiment and break its morale. Tasked with patrolling the mountain ranges these dwarfs carry huge axes with which to fight the wild beasts that plague the dwarf homelands. On the battlefield they support the army; scattering the foe with mighty swings of their fearsome blades. The dwarfs are not famed for their cavalry, though it is a foolish foe that discounts the cattle riders. Though they slowly trot into battle, the hardy mountain cows they ride can soon become a charging mass of horns, the dwarf rider doing all he can to stay in the saddle. Dwarf armies are accompanied to battle by machines of war. The bolt thrower is moved into position by its two dwarf crewmen where it can fire huge bolts capable of piercing several men at once. Lore: the Priests of the Dwarfs invoke their gods of healing and protection to aid them in battle. Use the Priest Lore deck from BL1e with the following changes. These were a touch on the weak side when it came to doing some damage. These were very powerful and required toning down, a rethink ensued with the following results. ...........you're just bitter because the mighty dwarves charged across the battlefield and smashed your disgusting green scum into a nasty pulp! You made the Clan Chiefs Infantry rather than elite abd dropped the cost ... why the change? They lose 1 figure and they become worse than Clansmen. Until they both go down to 1 when they are back on par again. A collection of human cities based around the coastal region of Torue Albes. Governed by a Queen, they have so far resisted annexation by Daqan. They control much of the coastal trade which pays for a standing army of Free Company to protect the kingdom. Employing the devastating but cumbersome crossbow, the Arbalestiers provide ranged support for the Free Company. Slow to reload and not as accurate on the move, they are often deployed on the flanks to deter flanking cavalry. The main line of the Free Company, these mercenaries can be relied upon in a fight. Armed with a sword and a heavy kite shield, they are adept at closing with the enemy in good order with shields raised, giving the enemy little room to fight back. The main job of these mounted infantrymen is to bait the enemy into a prepared position. They are able to quickly withdraw from an enemy charge drawing them onto a coordinated attack by other free company units. The Pikemen fight in large defensive blocks, pikes out to the front. Standing tightly together shoulder to shoulder the enemy is presented with a wall of death making it very difficult for them to come away from a fight unscathed. Enemy cavalry should steer well clear of pikemen as horses have little hope of survival against them. Riding atop a large stallion and resplendent in the best armour, the mercenary captain leads his men from the front. Shouting words of encouragement and leading by example, he inspires the men around him to greater deeds. 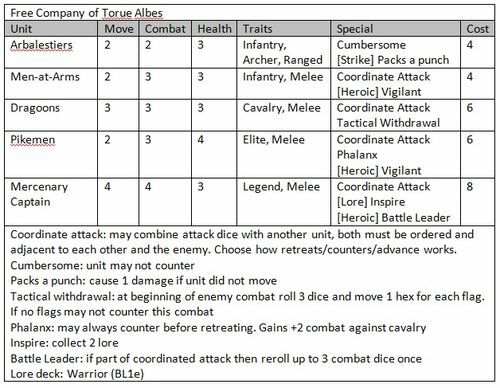 Coordinate Attack: Free Company units may combine combat dice with that of another unit with the coordinate attack rule. To do so both units must have been ordered and both must be adjacent to each other and the target enemy. 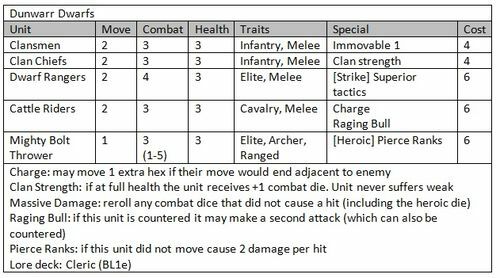 Calculate the combat dice for each unit separately (including any bonuses/restrictions) but roll all the dice together. Any dice may be spent on any of the involved unit’s special abilities. The Free Company player also decides which units count for counter or retreat/advance. The Free Company mercenaries excel at battlefield tactics. Use the Warrior lore deck from BL1e with the following changes. Thanks very much for your work on this. I'm afraid I'm a "foul-weather" player, in that I really only play these when I don't have something else I need to play, but I do own both 1E and 2E. (I believe I own both of these due to my OCD, not necessarily a need to play them both heheh). Anyway, looking forward to making them work together, and seeing your conversion info Thanks!